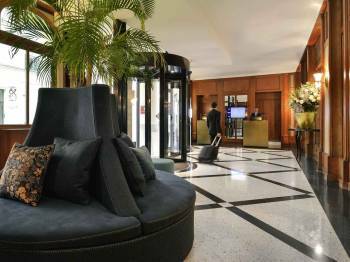 Located in the center of Paris, near the theaters and cabarets of the Grands Boulevards and the Opéra, the epicenter of French culture and art, the 4-star L’Echiquier Opéra Paris is a modern Art Nouveau style hotel. The newly renovated hotel illustrates the Belle Epoque with woodcuts, mosaic floors and decorative painting. Our rooms and suites welcome you in an environment that is modern yet reflects the ambience of a Parisian apartment. Room measuring 258 sq. ft. (24 m²) with natural light, a screen, video projector, flipchart, dynamic display and free WIFI.